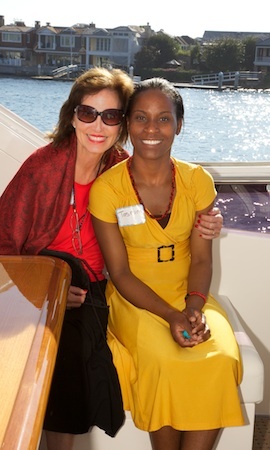 Mary Ellen Carter with Tasmim Mapira, of Malawi, visiting U.S. sponsors of her education during a recent trip. In 2006, Laguna Beach resident Mary Ellen Carter joined her husband, federal Judge David Carter, on a trip to Malawi, a landlocked country about the size of Pennsylvania in southeastern Africa. While her husband counseled the judiciary on how to avoid money laundering by terrorist organizations at the behest of the U.S. Treasury Department, she commandeered a hotel driver for a trip to a nearby village to distribute the school supplies and over-the-counter medicine she had brought from home. That one charitable act started a chain reaction. A year later, Carter established the Laguna Beach-based non-profit Direct Connections to Africa, which, among other things, provides high school scholarships. One of the first 10 high school graduates sponsored by the nonprofit, Tasmim Mapira, just wrapped up a three-week visit to Laguna Beach sharing her experiences with local audiences. Despite feeling overwhelmed by leaving her poor homeland for the first time for the abundance of Orange County, Tasmim graciously accepted the role of Malawian “ambassador” to raise awareness about her country’s hardships and to highlight Carter’s mission to improve lives there. During Carter’s initial trip, Sarah, the grade school teacher who so gratefully received the donated school supplies, shared her dream of starting a pre-school. Realizing how a little could make a big difference in Malawi, Carter started sending boxes of supplies to Sarah after she returned home. As the pre-school began to evolve with her help, so did Carter’s plans to make a more permanent commitment to the Malawian children. She founded Direct Connections to Africa, which besides its role in establishing and supporting Sarah’s preschool, which now enrolls 280 students, supports education elsewhere. The nonprofit provides children clothing and school supplies, funds tables and chairs in classrooms and books for libraries and supports school expansion. Levels of giving range from $25 to supply flip-flops to 20 shoeless kids to $80,000 to build a library/computer building. Well aware of typical pitfalls of philanthropy without oversight, Carter has two trustworthy representatives who supervise the nonprofit’s spending in the village and she herself travels there each June to check up on the projects. The organization’s signature program matches high school students like Tasmim to U.S. sponsors, who underwrite their enrollment in Malawi schools. The Malawian government supports children through primary school, but enrollment in high school requires fees of roughly $300 a year, an amount few can afford, to say nothing of college. A World Bank study says fewer than 25 percent of eligible Malawian children remain in school by eighth grade. The study attributes this to household economic constraints and lack education infrastructure. Malawi’s GDP per capita is $900, 217th in the world, according to the CIA Factbook. Direct Connections requires high school-student sponsors to commit to the full four years, to avoid a student’s losing funding before graduation. Carter, a counselor by profession, also aims to see her mission become self-sustaining. She counsels Sarah on collecting something from preschool parents to demonstrate the value of education. Likewise, the sponsored students must write monthly letters to their benefactors and connect with them. Now a high school graduate who will complete a two-year, college-level hotel management course in December, Tasmim was matched with Carter’s friend Magrette Bass of San Clemente. Bass paid for Tasmim’s college instruction as well. With an eye on her future career, Tasmim visited restaurants and hotels during her stay, asking managers questions about their operations. “It’s fun following through with a student,” said the 62-year old Carter, who supported another Malawi student, John, through high school and now pays his way at the hotel management school. After arriving here, Tasmim was most impressed by the big roads, countless cars, and especially the abundance of food, clothing and water. Orphaned at a young age and living with her aunt in a small village, Tasmim used to walk two miles to get water every morning before school, then walk five miles to high school. After school, she made another trek to retrieve water before tackling her homework, by which time, she admits, she was often exhausted. Fortunately, while attending college in the capital city of Lilongwe, Tasmim lives in a kind of pension near the school, which provides room and board and she has more time to devote to her studies. Bass and Carter shared the expense of bringing Tasmim to the U.S. Because of the difficulty of getting a visa, Carter enlisted the help of the U.S. Ambassador to Malawi. Even so they jumped through a lot of hoops. For more information about DCTA, visit www.dctafrica.net.